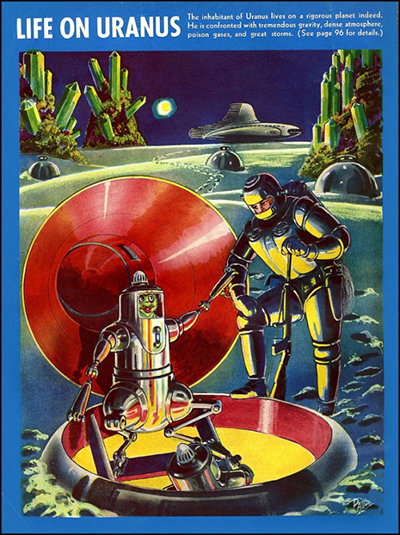 Life on Uranus, Frank R. Paul, 1940. I came back from Eastercon 2015 with several pulp magazines, including a couple of copies of Fantastic Adventures carrying Frank R. Paul’s ‘Life on..’ series. This was a wildly optimistic attempt to extrapolate alien life on the planets of our solar system, based on the knowledge of the day. I thought I’d share my particular favourite, the iconic Life on Uranus from Fantastic Adventures, April 1940. The text is by Henry Gade. On our back cover this month we present the artist’s conception of the inhabitants of the planet Uranus, deduced in imagination from scientific facts about that world as astronomers know them. Uranus is one of the four major planets and therefore, one of the four upon which the most strange conditions of theoretical life must exist. Before attempting to picture the life form the planet might possess, we must consider the facts, meagre indeed, known about the giant world. First, it is the seventh planet in distance from the sun, revolving in an orbit at a mean distance of 1,782,800,000 miles. It takes 84 years to complete its voyage over its orbit. Its diameter is 30,900 miles or nearly four times that of earth. However, its mass is only 14,6 times that of earth, which places its density at 0.25 that of our own planet, and 1.36 that of water. From these facts we must deduce that it has a great proportion of gaseous elements in its makeup, probably indicating a tremendously thick blanket of atmosphere, of many kinds of gases, most of them poisonous. However, its great distance from the sun means it must be a cold world, and we may find the surface of the planet consisting of a great quantity of liquid, frozen to a great depth. There would be some land areas, probably crystalline or metallic (aluminium, bismuth etc.) in formation and rather impracticable as a means of supporting life. 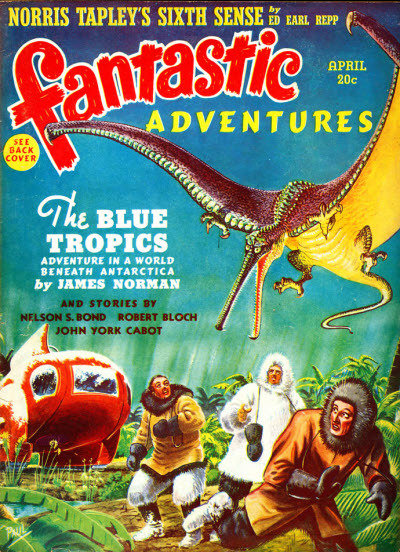 Fantastic Adventures April 1940. 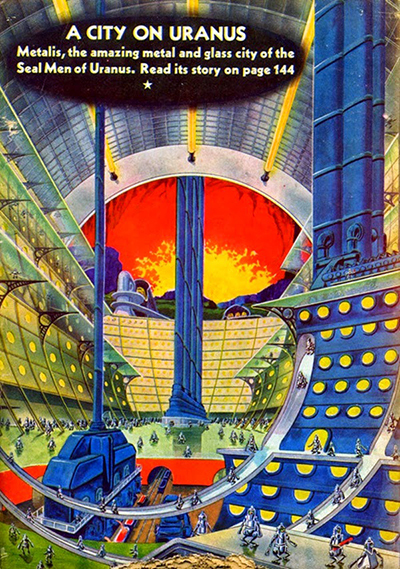 Cover by Frank R. Paul. Uranus is a pale, sea-green in colour, which may come from its atmospheric blanket entirely, or from its watery surface, visible through the atmosphere. There is no reason to assume we could not observe the surface through the atmosphere even though it were extremely dense, because the cold world would result in clarity through precipitation of foreign and non-gaseous elements in suspension, and in the lack of precipitation of a liquid nature, or even rare snowstorms. Bearing all these facts in mind, let us voyage to Uranus and land our space ship on the frozen surface, after a perilous journey through an atmosphere that is dense enough to cause us great worry as we cut down our speed to avoid overheating from friction. Finally, however, we land. We find it necessary to wear our space suits, and perhaps we have out anti-gravity shoes on. We’d have trouble carrying our 400 pounds of weight, if we didn’t don them. We carry a weapon, because we’ve noticed some very peculiar metal domes sticking up out of the icy terrain. It is evident that it never melts, and the structures seem quite permanent. However, we won’t be too sure, because it’s “winter” where we have landed, and these things look as though they would float if the ice melted. No telling what we’ll find inside. Or what will emerge to greet us. We walk through the thin, powdery snow, and we pass one of the metal domes. It’s hollow, but there’s no answer to our pounding. We pass on. But we’ve been observed. The next dome opens, startling us. Peering at us, we see a queer metal being. No, he’s not metal. It’s a suit he’s wearing. He remains motionless, regarding us with a cold stare. We come closer. A City on Uranus. 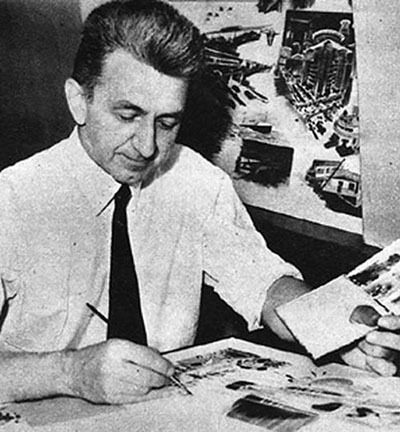 Frank R. Paul. Amazing Stories April 1941. We see a queer, tiny green-furred being. He seems unafraid. But we feel certain that he’ll pop down if we make an overt move and slam his dome down over him again. Reminds us of a ferret, somehow. Approaching, we signify by sign language that we intend no harm, and we descend into the interior of the Uranian’s queer home. We are amazed. We find a veritable little city, all self-contained in metal. Here is a frozen world with all the elements that would force a living being to develop scientifically in the struggle for existence. He has built himself a home fitted with all the comforts possible. Air-lock, to keep out the poisonous outer atmosphere. Air purifying plants, furnishing an atmosphere much too heavy for us to breathe, although the Uranian now takes off his suit and reveals himself as a squat, little fellow, with webbed legs, short and powerful, and tiny, many-fingered hands, with webbing between them. Obviously, he is partly amphibian, We learn to our astonishment that he is able to descend below the ice crust of the planet and swim like a seal in the water below, where grows his food supply. These are mostly seaweed, small fishes, and jelly fish. Down below, the water is warm, in fact it becomes hot at great depths, because Uranus’ great bulk retains much of its original heat. It is only the surface that is frozen. At times, we learn, the heat increases, and the ice melts, allowing steam to escape, and accounting for the strange white bands in the atmosphere noticed by earth astronomers through their telescopes. This also accounts for the snow we find outside. Evolution has driven this being to prepare himself for an ultimate life on a world which will be entirely frozen, and the watery underworld no longer exists as the planet loses its natural heat. Thus, the city we entered is the forerunner of Uranian surface cities built on everlasting ice. At present, they are temporary affairs, capable of floating at the season of melting. Peculiarly, of all four giant worlds, Uranus is the one most fitted to support an intelligent form of life, and it is a world where we can expect to find such life with more assurance than we would anywhere else in the solar system with the exception of young Venus, and ageing Mars.